Barullo de La Alqueria (2000): Classic Fino stallion not shown in the United States. Natural collection, exceptional mechanics, upright carriage and outstanding phenotype. His third years foals are undergoing saddle training in 2010 and show to have his outstanding talent and beauty. Maraquita La Rosa by Retorno del Ocho. 2003, 2005, 2007 Confepaso World Champion Fino Mare in her age group and Grand Champion Fino Mare. 2009 Confepaso Mundial 2nd place in her age group and Reserve Grand Champion Fino Mare. 2010 Ponce International Champion Fino mare in her age group and Grand Champion Fino Mare. Many times PFHA National and Grand National Champion Fino Mare. 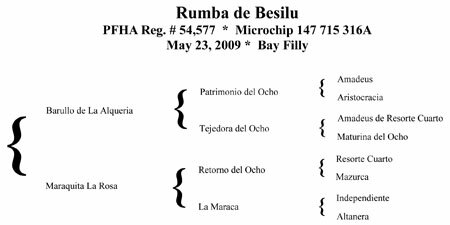 Dam of Maraquero La Rosa (PFHA National Champion Fino Colt in his age group), Maraquita La Rosa IV, fino filly with placements at PFHA shows. La Maraca by Independiente. Dam of Maraquita La Rosa (above) and Maraquita La Rosa Tres, PFHA National and Grand National Champion in Performance Mares and A/O Performance Mares, Maraquero del Pinal, Apostol Pablo.